A C.G. Conn EEb Contrabass Sarrusophone has come up for sale from Quinn the Eskimo on eBay. Happy 2018! I now have Contrabassoon swabs available. These are made from silk and are used like a push through swab. After playing, remove the tuning slide and insert the swab into the wooden “wing joint” to remove moisture. This week I had a few Leitzinger Contrabassoon Bocals on trial from Forrests Music. I had a Leitzinger NML2 bassoon bocal a few years ago when I played on a Fox 601, but I sold it since it didn’t pair so well on my Heckel 10k. What I so appreciated about that bocal was the easy high note response and clarity in the tone. That bassoon had some funny pitch issues (saggy middle E) that the Leitzinger fixed immediately. I have been using a Heckel C2 that suits the instrument well, so trying new bocals is just out of curiosity. Forrests has a large selection of Leitzinger contra bocals so I got to try each type and plating option, I ended up really liking a F2 Gold plated and an F2 platinum. Now that I have had them at home for a few days I have a sense of what these are able to do. I notice almost no difference in response, pitch, or tone from the Heckel and the high notes are just as solid. 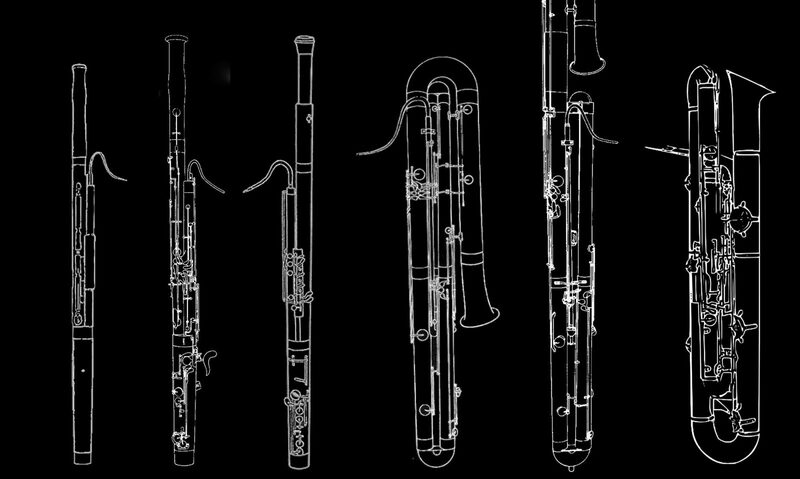 The one improvement I do notice is when I use a light reed and play loud sfz attacks sometimes the pitch can sag with the Heckel, and the Leitzinger is more stable. However I do not like the bend, it angles down much more than I would like which forces me to change the instrument position. And lastly the price point is high. This thing comes in at $2,300 which is much more than a new Heckel bocal, without a huge sound difference. I am impressed by the sound and quality of this bocal but it’s a little too much for me! A Contrabassoon has entered my life recently and I am very excited to start using it. This instrument was owned by Steve Braunstein. He ordered it from Heckel while he was playing with the Toronto symphony, it was finished 1984. Over the summer I trialled 2 other Heckel contras and this instrument was by far the standout. I am very lucky to be the custodian of this horn for a few years. I get asked about the Contraforte vs. Contrabassoon and I mostly stay quiet. But I think that the entire repertoire is accessible to either instrument. I would like to experiment with using both instruments this season, choosing the instrument that fits the character of the piece. #Repost @nomadsession ・・・ Just finished our narration run through of Ocho Bendiciones with @nicklbenavides! Catch the premiere next Friday at Noe Valley Ministry! Thanks @musicatnoon for having us!